Castanet is laid out around your farm, in the middle of the area. From your farm you can walk to all 3 districts. Once you unlock the circus animal taxi service, getting around becomes much easier. You have view your built-in game map if you press the plus ( + ) button on your Wii remote. You farm is in a set location in the Farmland area. You do not get to choose from several different locations like in Tree of Tranquility. The farm comes with one plot of farm soil, which already has some crops and trees on it to help you start out. It also comes with a poultry and livestock barn that you can upgrade to a larger size later. The entire middle part of Farmland is set aside for your farm. There are two additional land plots you can buy that are spread out from your farm, plus the water wheel you can unlock from Dale. In the town you'll find the clothing stop, bar, photography studio, town hall, health clinic, inn, and the fishery. Most of the time the shop owners will be inside their stores and do not wander very far away. On Sundays the shops are closed. Access to the tropical Toucan Island will be available once you ring the Blue Bell and unlock Pascal. You can buy a boat ticket from Ozzie's shop and hand it to the sea captain, who will take you to and from the island. If you want to go back to Toucan Island, you have to buy another boat ticket. There is also a school above the Town Hall. The school room is empty most of the time until the marriage rivals begin to hook up and have their own children. After that you may find a few of them inside the school, but you won't see any classes in session like in the opening title movie of the game. The church is located off the main path through Harmonica Town. The plaza is often the location for festivals, as it is wide and spacious to hold a lot of people. 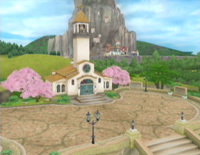 Not very many villagers even visit the church. Typically the only person you'll see inside is Perry. The staircase that leads off from the plaza will take you to the graveyard. If any of your animals die (from sickness or old age) you will view a cut scene from this location of you crying over the animal's grave. A little ways north from the graveyard is the mine cart shortcut. This is a quick ride up to the Garmon Mine District. It is usable after you ring the Red Bell and feed Bo enough food to keep him working on the mine cart repairs. The mining area can be reached by taking the mountain path behind your farm. The area is more industrial than the main town, and you'll find the carpenter, makers, jewelry, and blacksmith here. The district also has two ore mines in Garmon Mountain and access to the Goddess' Spring, where the divine tree is located. The shopkeepers in Garmon Mine District close their shops on Thursdays. You can see them wandering around in front of their stores except for Ramsey, who seems to like to stay indoors 100% of the time. The path leading to the divine tree is located between Dale's carpentry shop and Barbara's general goods store. At the end of the path you'll find the Harvest Goddess and her tree. There are some areas to fish at, but not much else is here. Every time you ring one of the colored bells, the Harvest Sprite associated with the bell will move to the Goddess' Spring area. Eventually you will have all 5 sprites dancing and wandering around the Goddess. Access to the forest is locked until you acquire an Axe. You have to keep the Axe in your rucksack when you try to enter the forest, else you'll find the gate to be locked. The forest is a maze of several randomly generated screens. Each time you enter a new area, you have to look around the outside edges to find the path leading to the next screen. There are sometimes trees and rocks that block the exit path, so the Axe and Hammer will be necessary to use. Each day in the forest you'll find a single Fugue Mushroom growing, which is an excellent gift for either the Witch or Wizard marriage candidates. At the end of the Fugue Forest you'll find the Fugue Swamp, where the Witch lives in her lonely little hut. You will also find some fishing spots and a variety of wild animal pets you can befriend. In the far corner of the Flute Fields is Horn Ranch, where all of the poultry and livestock animals come from. The ranch is very spacious and takes up a large portion of the entire meadow. You'll find the ranch's shop is run by Hanna, who can sell you a variety of animal products. Down on the very north side of the ranch you'll find a gate that leads to the race track. Animal racing is the only mini game in Animal Parade. To use the race track, talk to Cain when he is standing next to the gate that leads to the track. You can have up to 3 of your friends play the racing game with you, as long as you have enough Wii controllers. 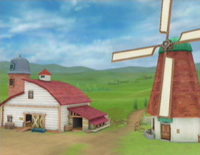 The ranch also has a very large windmill. The mill is used for processing Rock Salt, Sugarcane, Chili Pepper, and Coffee Beans into ground form used as cooking ingredients. The harder the wind is blowing on that day, the better the quality of the milled goods will be. 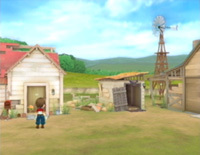 The windmill is free to use but you must travel all the way to Horn Ranch to do so. 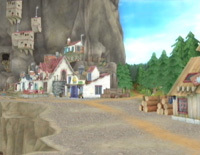 There are actually a few buildings in this area; the farm's store, Chase's house, and Julius' house just to the south. The Marimba Farm shop is run by Ruth and her husband, Craig. You can buy your crop seeds from here, plus crops themselves in case you don't have the time to wait for something to grow on your farm. The farm also has a locked gate on the southern side, which you will gain access to as you go through the steps to ring the Yellow Bell. Chase's house is next to the farm. He'll be inside his house from 8:00 am until he leaves to work at Hayden's Bar in Harmonica Town around 6:00 pm. Julius' house is just south of the farm area but you can only find him inside between 8:00 am and 11:00 am on Thursdays. In the later parts of the game, your mission is to summon the King down from the heavens. 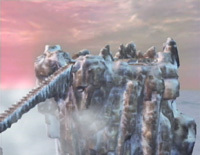 The platform where the summoning takes place is on the top floor of the Garmon Upper Mine. 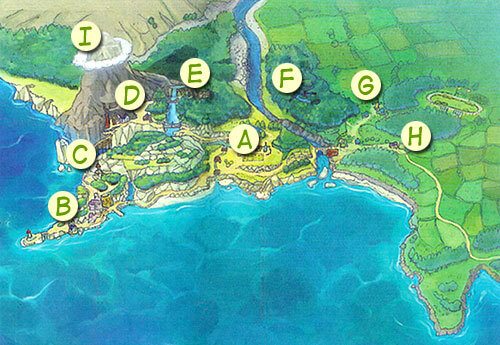 This area also has a hot spring and a Power Berry, but not much else. After you summon the Harvest King down to the mountain, he will stay there at his platform. You will have to go through the mine one more time to reach him. After you talk to him, the King will activate carvings on the cliff-face wall that act as a teleport from the base of Garmon Mountain. You just have to press A when standing next to the carvings in order to transport yourself to the top or base of the mountain. The tropical island is not in Castanet, but you can travel there by boat after you ring the Blue Bell. Selena and her parents, Samson and Sue, run the Pineapple Inn on the island. 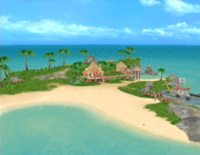 The island has tropical fruit you can pick such as Bananas and Pineapple, plus it is a good spot for fishing. 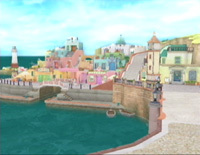 The boat ride to the island costs 400 G. You can buy boat tickets from Ozzie's shop when he's open, and then hand them over to Pascal on the boat dock in Harmonica Town. The return trip from the island is included, but if you have unlocked the animal taxi service, you can leave the island by using the circus animals.